Learn about Macau, China by reading Take Your Bird for a Walk! - Macau, China by Sandy Zimmerman, Travel Writer. It features a mini, but thorough tour of the destination, plus all you'll need to know to plan your trip including getting there, objective information on places to stay and eat, and things to do. At the end of the article, we've provided a summary of the contact information for your easy reference. Enjoy! After visiting China four times, I have always been fascinated by the people and their culture and want to convey the TRUE “Macau Experience” - the sights, tastes, sounds, and “feeling” of visiting Macau. I watched several men and women “walking their birds” around the streets of Macau. Of course the birds were in their owner’s ornate bamboo cages. When I asked why, a woman replied, “Don’t you walk your dogs?” The birds are given a breath of fresh air as their owners attend daily chores. Whenever the owners are busy shopping, eating, performing Tai Chi exercises, and talking to friends, the birdcages are hung on tree branches or on wall hooks at restaurants and shops. Lou Lim Ieoc Gardens- bridge and lake. Walking through the Lou Lim Ieoc Gardens is an extraordinary experience, an insight into their way of life. 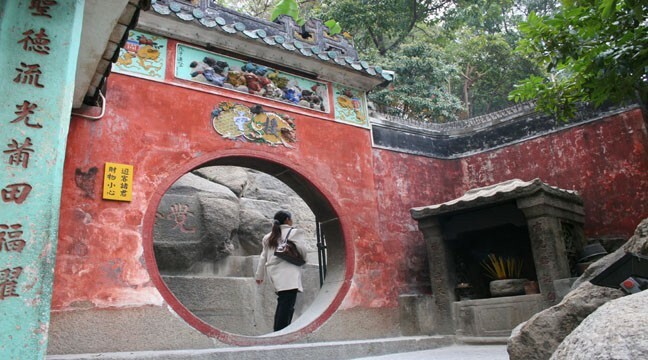 Here, in one of Macau’s most beautiful settings, the Garden offers secluded hideaways, romantic grottos, moon gates, and bamboo groves. I suddenly came upon four women singing Chinese operas while they played ancient musical instruments. Just a few steps across a bridge, a lady was performing a Tai Chi sin dance with two large red rice-paper fans. Another woman danced with a sword. My path led to a nine-turn zig zagging bridge across the pond. The Lou Lim Ieoc Chinese Garden was built during the 19th century. Our tour stopped downtown in the old city. Girls cook in front of you at demonstration tables outside the shops. We tried complimentary samples of local food. A lady at the Chinese Medicinal Tea stand diagnoses people’s symptoms and prepares special tea remedies for diarrhea, colds, etc. UNESCO included the “The Historic Center of Macau” on the prestigious World Heritage List. 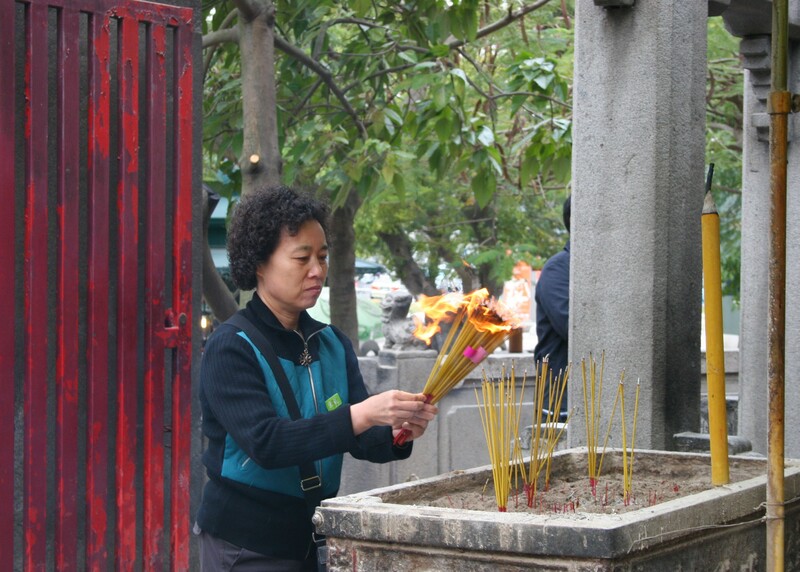 Woman lighting joss sticks at A-Ma Temple. One of the highlights of the tour was seeing the ancient 500-year-old A-Ma Buddhist Temple - the oldest temple in Macau. People held flaming joss incense sticks as they prayed and made offerings at the large koro incense burners scattered around the temple. 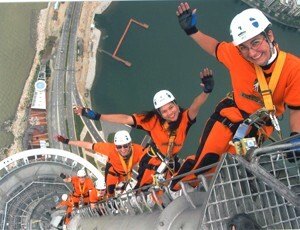 People climbing up mast at Macau Tower. Macau has the first adventure course of its kind in the world. The Macau Tower is the 10th tallest freestanding tower in the world, and the 8th tallest in Asia. On the 61st floor’s outdoor observation deck, walk to the outer rim and if you can take the first step, you will fly through the Macanese sky at 46 miles an hour. Unlike bungy jumping, SkyJump is a controlled aerial trip involving no rebound or hanging upside down. A cable is attached to the person’s harness. Based upon the principle of 'fan descenders', a technology used in skydiving training and in performing 'falling stunts' in movies. They designed several extreme sport courses around the tower’s body, legs, shaft, beams, and mast. During Skywalk X, you walk around the outer ledge of the tower just like you see them do in the movies. There are NO handrails! Everyone is harnessed, attached to a cable, a world-first overhead rail system for safety. Groups participate in team building - most of the members are blindfolded except one person who leads them around the ledge. Skywalk takes you under the pod of the tower, around an outdoor, open bridge with a see through metal grate. Climb the Mast’s vertical ladders, 328 feet above the Tower, or 1,108 feet above the ground. The first of its kind in the world, Ironwalk weaves around the legs of the Tower at a height of 26 feet and takes 20 minutes to complete. The youngest participant was 19 months and the oldest a 96 year old man. After watching all of the people participate in the adrenaline-pumping challenges, I decided to take the elevator down. Even Macau’s hotels are unique. From the moment I walked into the Hotel Lisboa, the atmosphere made me feel as though I was entering a palace. The lobby is filled with Dr. Stanley Ho’s priceless collection of sculptures and art works created with jade, ivory, gold, and precious stones. Some of these exquisite museum quality pieces were 6’-9’ feet high, towering above us. The exceptionally large crystal chandeliers nearly covered the domed ceiling, while marble floors, glittering mosaics, hand painted murals, and golden dragon designs decorated the public rooms. The resort’s exterior is an exotic, unique blend of Portuguese and Chinese architecture. The ultra-luxurious new Sands Macao Resort is the first world class American owned casino resort in China. The management is creating a Las Vegas strip in the Macau’s Cotai district- Venetian Resort, Wynn Resort, Hilton Hotel, Intercontinental Resort, Four Seasons, and others. The casino is enormous- 165,000 square feet with 65’ high ceilings. This is one of the largest casinos in the world. When a Chinese guest walks through the door, it is not just for entertainment. He comes to face his destiny. The guest is at war with the casino. Asian gamblers bet the current maximum $1 million per hand (Around $770,000 American). The Paiza Club is named after the gold tablet Chinese Emperor Kublai Khan gave to Marco Polo in the 13th Century. This was a guarantee for unrestricted travel across Kublai Khan’s vast empire, a signal to the warlords to give fresh water, shelter, food, horses, and other supplies during Marco Polo’s journey. The hotel’s golden exterior glistens in the sunlight and one chandelier is 120’ long, 25’ wide, 50’ high, and weighs 100,000 pounds. When Portuguese explorers arrived in 1557, they were told the name of the bay was A-Ma-Gao and translated it into Macau, the name of their new city, which became Europe’s first settlement on the China coast. Macao has been returned to Chinese sovereignty “one country, two systems,” in 1999, after 450 years of Portuguese rule. See the REAL Macau - the historic sites, Portuguese restaurants, and especially the PEOPLE! Visitors arrive at the international airport in Hong Kong, and take either a cab or bus to the ferry. Notice: This information is current as of April 2006. It is recommended that you contact the numbers, and/or visit the websites above to determine any changes to the information.